Well here we are sailing 50 miles north of Algeria. We can't see any land so not much to report visually. Played my first bridge tournament today and await the result but not too hopeful, very much like golf your biggest enemy is yourself, and It is really addictive. Spent the afternoon relaxing on the back of the ship out of the strong winds. Still sunny but windy and only 16 deg. The TV so looking forward to that. Life without mobile phones is great I can't even remember what my ring tone sounds like that will change soon. I often look at the sea and dream of what it was like for real sailors sailing ships across the seas with no sat nav and in ships of only perhaps 100 tons not 45,000 tons. 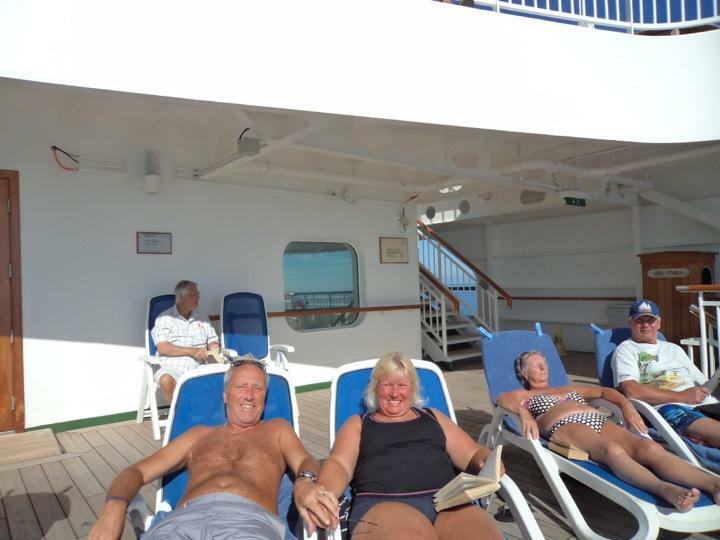 We met a couple that have been on back to back world cruises every winter for 13 years! The funny thing is when you speak to them, the bit they enjoy most is the fact they have been on the most of everyone on board, nothing to do with all the marvellous places they have visited, it's like a badge of honour. Incidentally their total on board spend since Southampton is £300. So I'm not too sure what exactly they do all day and night. They don't drink at the bar .... ever. They seem to sit in their cabin drinking duty free Gin, funny old world. Footsie update Chelsea won the match with a couple of helpful decisions by the ref. it's fair today they will need to improve somewhat. If they have any chance of not being badly beaten by Barcelona.